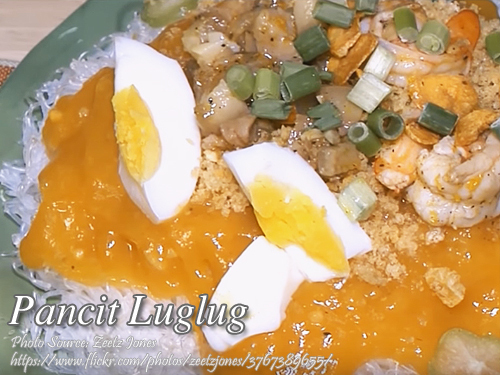 Pancit luglug is I think a Kapampangan version of pancit palabok. A saucy noodle dish mixed with luglug sauce and topped with sliced pork and shrimp, garnished with crushed chicharon, kamias, spring onion and hard boiled eggs. Actually the word “luglug” is a Kapampangan word which means to “rinse” or “wash” the noodles in hot water until it is cooked which is the traditional way of cooking the noodles. Also, pork is the traditional topping for the pancit luglug and using shrimp and other seafood like squid or mussels might be just a variation and adaptation of cooking this dish. Blanch the pork mask twice to remove the impurities. In a pot, put 12 cups water (or more), pork mask, peppercorns and salt. Boil the pork until almost tender. Separate the pork rind and fat from meat and cut into cubes. Set aside the pork broth for later use. To make the annatto oil, heat the half cup of cooking oil with the annatto seeds for a few minutes. Remove the seeds from the pan and soak the seeds in 1 cup warm water with a drop of lihia. Set aside for later use. Fry the garlic until crispy. Remove the fried garlic and drain from the oil and set aside. Leave the oil in the pan or wok. Wash the shrimp head and shell and drain. Toast in a pan until for a few minutes then pound in a mortar and pestle. Boil 2 cups of water and put the shrimp head and shell with a little salt. Cool and let the shrimp head and shell soaked for a while until needed. In a medium size wok, in a low fire, saute the pork rind and fat. Saute until the fat is rendered then put the minced garlic and minced onion. Saute until the onions are soft. Then add the meat and stir for a few minutes. Add 3 tablespoons of vinegar and 1 tablespoon of fish sauce. Simmer for a few minutes and do not stir. Add some pork broth and simmer until tender. Set aside the cooked pork mask but leave some sauce and the bits that sticks to the pan. Heat the pan used in cooking the pork topping and pour the shrimp broth. Strain the shrimp broth before pouring in the pan. Bring to a boil and simmer. Turn off heat and set aside. Meanwhile to make the shrimp topping, in the wok where you fry the garlic, put some minced garlic and saute. Add in the patis, vinegar, pepper and simmer for a few seconds then add in the shrimps. Stir and simmer until the shrimps are cooked. Set aside. To cook the pancit luglug sauce, heat a stock pot and put some annatto oil. Add the garlic and saute until fragrant. Add in the chicken bouillon cubes and shrimp broth. Pour and additional pork broth about 7 cups. Stir add the patis and bring to a boil. Simmer for a few minutes then pour the rice flour mixture. Stir while pouring the rice flour to avoid curdling. Pour the annatto water while stirring to add more color to the sauce. Simmer while stirring until the rice flour is cooked. Turn off heat and pour the cornstarch slurry and stir constantly until the sauce is thick. Cook the bihon noodles by boiling it in water. You can also use the package directions as a guide. Drain the noodles and set aside. On a serving plate, put some of the bihon noodles and pour a desired amount of pancit luglug sauce. Put some pork toppings and shrimp toppings and arrange accordingly. Garnish with fried garlic, crushed pork chicharon, spring onions, kamias, bean sprouts and boiled eggs. Hi Lilia, thanks for the kind words! I really appreciate it! I’m happy that this recipe blog have help you in my own little way. Cheers!